​There will be five panelists per workshop. Each panelist’s presentation will be five minutes maximum. There are four workshops. You will find your workshop assignment below. The workshops are grouped into four themes: Assessment, Integration, Psychopathology, and Roadmap. Although each speaker’s presentation content may not strictly focus on the workshop theme, the ensuing discussion during the interactive component will be focused on the workshop theme. Each panelist will speak in succession, with no time reserved for questions during that portion. The workshops are 90 minutes long. With five speakers, we expect the presentations to be complete by 30 minutes. 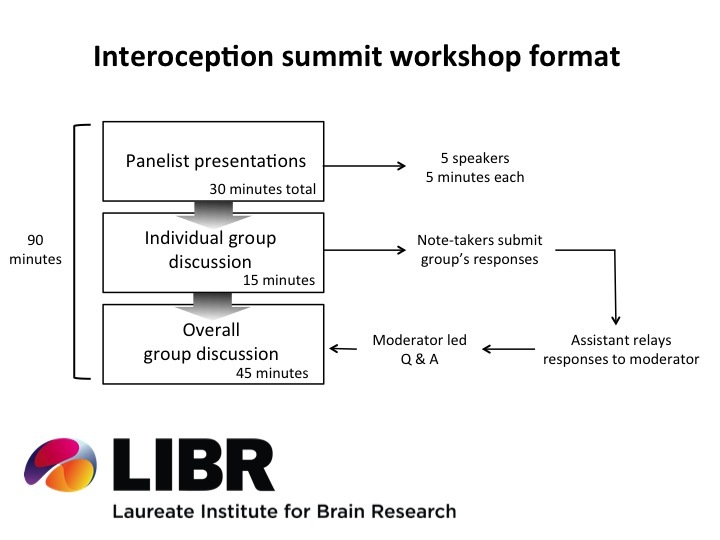 The remaining hour will be purposed to engage the panelists and attendees in discussions of how each specific workshop theme (i.e., Assessment, Integration, Psychopathology, or Roadmap) can be used to improve our understanding of how interoception is linked to mental health. As soon as the talks are completed, several questions related to the workshop theme will be posted on the projector screen. The panelists will form into a small group of five, and select one question to address during a 15 minute discussion period. At the same time, the attendees will also form into small groups of five, and they will do the same. Each group will generate responses to the question they have selected, which will be transcribed by the group’s note-taker (for the panelists, this will be the panel moderator; for the attendees, it will be a LIBR staff member). Each group’s responses will be submitted electronically to a website by the note-taker. Immediately after this period, the panel will present their answers to the entire audience. Discussion will ensue, including interactive questioning from the attendees. Responses submitted by the attendee workgroups may also be selected by the moderator, for further discussion by the panelists. This final stage will take approximately 45 minutes. At the end of the meeting, all groups' responses will be collated into a document that can be made available to all attendees.